Among other things, we hope. 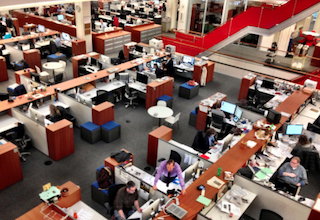 Now that James Bennet has rejoined The New York Times as editorial page editor, Times staffers are wondering if he’s suddenly next in line to be executive editor. Apparently Bennet is held in such high regard he might leapfrog deputy executive editor Susan Chira, seen by many as the frontrunner to eventually succeed Dean Baquet. “I think Bennet definitely has the experience and skills to be considered a potential executive editor, and would immediately join the ranks of possible successors — along with Chira, fellow deputy executive editor Matt Purdy, David Leonhardt, the founding editor of The Upshot, and others on the staff,” a source told The New York Post. The source added that Baquet’s successor “is all anyone at the Times is talking about,” which we’re just going to go ahead and guess is a slight exaggeration.